It was a bit of an up and down regular season for the boys soccer team. They got off to a slow start amid a slew of strong competition within KAIAC. 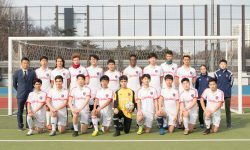 With an early loss to GSIS and a couple of uncharacteristic ties against Daegu, the guys failed to finish in the top 3 for the regular season for the first time in years. However, they peaked at the right time, coming into the tournament as a hot team. On their way to the championship, they would defeat both top-seated GSIS (who they had lost to twice) and 3rd seeded SAHS, who also came into the tournament red hot. This is the 2nd DI KAIAC Tournament title in Guardian soccer history. The boys didn’t want to stop there though. Their sights were set on a goal that has never been accomplished in Guardian athletics history, a KAIAC and Far East title in the same year. One opponent would stand in their way, a high-powered offense in MC Perry. Perry and YISS faced off 3 times during the tournament. The first ended in a tie. The 2nd was a tough loss for the boys. And the final loss came in the championship game in a penalty shoot-out. All around, a great season for the guys soccer team once again.